Adding to bass to a regular cab truck can be a real headache! Luckily we have the perfect solution for this problem. This dual 12" enclosure will fit into any regular cab truck and is designed to fit directly behind the seat. This is a sealed enclosure designed for sound clarity and the box has enough mounting depth for entry and flat-piston style subwoofer(s). We do recommend purchasing subwoofer grille(s) for this model enclosure to protect your sub(s) from rubbing?é?á into the seat. Our boxes are made from precision cuts of MDF. They are then liquid nailed, nailed and completely sealed. We then wrap them with high quality carpet that matches most vehicle interiors. All Boxes feature high grade spring loaded terminal cup(s) for the absolute best connection possible. All the custom series enclosures are made to fit precisely into your vehicle to the get the max performance from every extra inch of wasted space. We guarantee you will not only see a difference in the quality of the boxes we build, but you will hear the difference and that is what is it is truly all about. 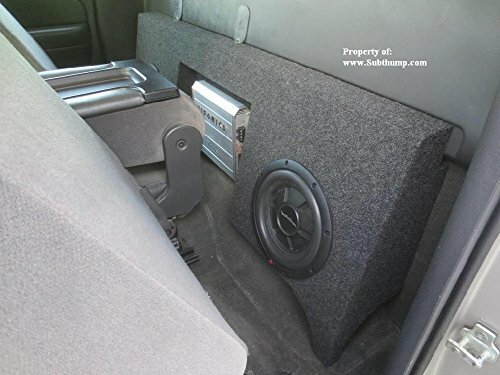 This Package Includes the Following Items:(1) Dual 12" Subwoofer Box(2) Kicker 2010 C12 Single 4 Ohm 12" SubwoofersSubwoofer Box Features:Dual 12" Sealed Truck Sub BoxMounting Depth: 5-5/16"Air Space: 0.96 Cubic Feet Per SubSealed EnclosureDimensions: Width 49-1/4" x Height 14-1/2" x Top Depth 4-1/2" x Bottom Depth 8"Designed to fit behind the seat of most trucksConstructed with High Quality MDF(2) High Quality Binding Terminal Cups (Accepts Banana Terminal Plugs OR Bare Wire 'up to 10GA')High Quality Gray Carpet This item is Brand NewKicker C12 Specifications: Kicker C12 12" Subwoofer Single 4 Ohm 150 Watts (10C12-4) Power Handling: Peak Power: 300 Watts RMS Power: 150 Watts Impedance: Single 4 Ohm Sensitivity: 88.3 Frequency Response: 27-500 Hz Mounting Depth: 5-7/8" Mounting Cutout: 11" This item is Brand NewKicker C12 Features: Best-sounding, loudest bass for the buck Super-rigid, injection-molded cone with 360-degree back bracing High-temp coil wire Vented pole piece for heat dissipation Strong steel basket with coil-cooling perimeter venting Ribbed surround for strength at high excursion Durable Spiraled tinsel leads Tough, yellow double-stitching on surround Handy spring-loaded terminalsKicker C12 Warranty Info: We are an Authorized Kicker Dealer. Adding to bass to a regular cab truck can be a real headache! Luckily we have the perfect solution for this problem. This dual 10" enclosure will fit into any regular cab truck and is designed to fit directly behind the seat. 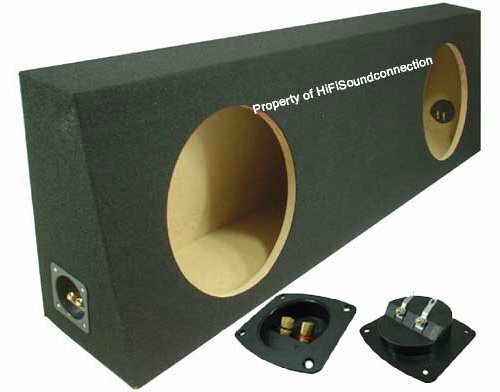 This is a sealed enclosure designed for sound clarity and the box has enough mounting depth for entry and flat-piston style subwoofer(s). 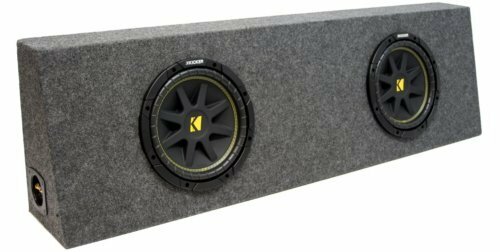 We do recommend purchasing subwoofer grille(s) for this model enclosure to protect your sub(s) from rubbing into the seat. Our boxes are made from precision cuts of MDF. They are then liquid nailed, nailed and completely sealed. We then wrap them with high quality carpet that matches most vehicle interiors. All Boxes feature high grade spring loaded terminal cup(s) for the absolute best connection possible. All the custom series enclosures are made to fit precisely into your vehicle to the get the max performance from every extra inch of wasted space. We guarantee you will not only see a difference in the quality of the boxes we build, but you will hear the difference and that is what is it is truly all about. 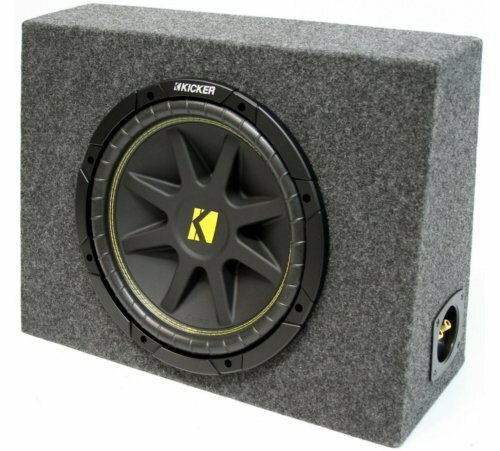 This Package Includes the Following Items:(1) Single 12" Subwoofer Box(1) Kicker 2010 C12 Single 4 Ohm 12" SubwooferSubwoofer Box Features:Single 12" Truck Sub BoxMounting Depth: 5-5/16"Air Space: 0.80 Cubic FeetSealed EnclosureDimensions: Width 20" x Height 15" x Top Depth 5" x Bottom Depth 7-1/2"Designed to fit behind the seat most trucksConstructed with High Quality MDFHigh Quality Binding Terminal Cup (Accepts Banana Terminal Plugs OR Bare Wire 'up to 10GA')High Quality Gray Carpet This item is Brand NewKicker C12 Specifications: Kicker C12 12" Subwoofer Single 4 Ohm 150 Watts (10C12-4) Power Handling: Peak Power: 300 Watts RMS Power: 150 Watts Impedance: Single 4 Ohm Sensitivity: 88.3 Frequency Response: 27-500 Hz Mounting Depth: 5-7/8" Mounting Cutout: 11" This item is Brand NewKicker C12 Features: Best-sounding, loudest bass for the buck Super-rigid, injection-molded cone with 360-degree back bracing High-temp coil wire Vented pole piece for heat dissipation Strong steel basket with coil-cooling perimeter venting Ribbed surround for strength at high excursion Durable Spiraled tinsel leads Tough, yellow double-stitching on surround Handy spring-loaded terminalsKicker C12 Warranty Info: We are an Authorized Kicker Dealer. Adding to bass to a regular cab truck can be a real headache! Luckily we have the perfect solution for this problem. This single 12" enclosure will fit into any regular cab truck and is designed to fit directly behind the seat. 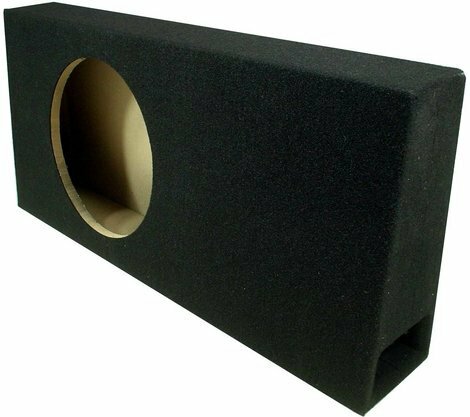 This is a sealed enclosure designed for sound clarity and the box has enough mounting depth for entry and flat-piston style subwoofer(s). We do recommend purchasing subwoofer grille(s) for this model enclosure to protect your sub(s) from rubbing?á into the seat. This baby is tough too, 3/4" MDF wood so you know it can take a beating! Our boxes are made from precision cuts of MDF. They are then liquid nailed, nailed and completely sealed. We then wrap them with high quality carpet that matches most vehicle interiors. All Boxes feature high grade spring loaded terminal cup(s) for the absolute best connection possible. All the custom series enclosures are made to fit precisely into your vehicle to the get the max performance from every extra inch of wasted space. We guarantee you will not only see a difference in the quality of the boxes we build, but you will hear the difference and that is what is it is truly all about. One of the best options for a regular cab truck is one of our ported enclosure that are specifically built with a truck cab in mind. 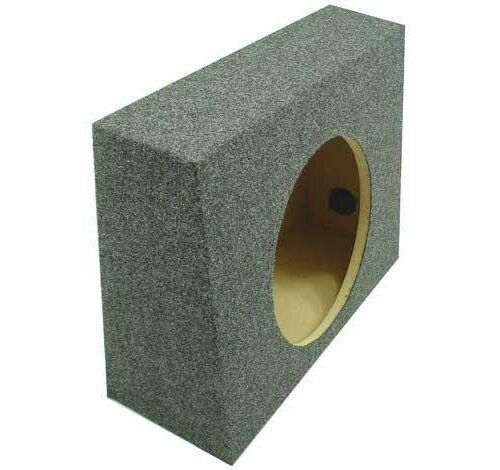 This enclosure will work a wide range of brands and subwoofers but you do need to look out for the mounting depth which is somewhat shallow. 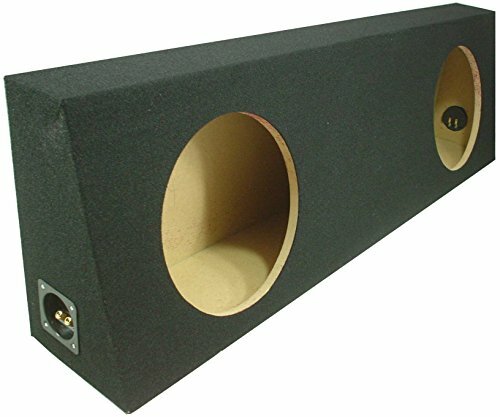 A ported enclosure is tuned to maximize the bass output within a certain frequency response range and since you are limited to the number of subwoofer you can run in a truck it help balance the difference in output. Our boxes are made from precision cuts of MDF. They are then liquid nailed, nailed and completely sealed. We then wrap them with high quality carpet that matches most vehicle interiors. All Boxes feature high grade spring loaded terminal cup(s) for the absolute best connection possible. All the custom series enclosures are made to fit precisely into your vehicle to the get the max performance from every extra inch of wasted space. We guarantee you will not only see a difference in the quality of the boxes we build, but you will hear the difference and that is what is it is truly all about. Adding to bass to a regular cab truck can be a real headache! Luckily we have the perfect solution for this problem. This single 10" enclosure will fit into any regular cab truck and is designed to fit directly behind the seat. 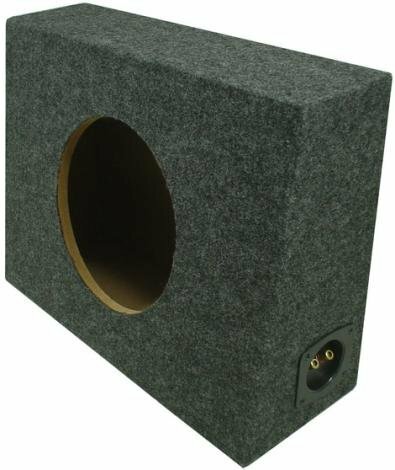 This is a sealed enclosure designed for sound clarity and the box has enough mounting depth for entry and flat-piston style subwoofer(s). We do recommend purchasing subwoofer grille(s) for this model enclosure to protect your sub(s) from rubbing?á into the seat. Our boxes are made from precision cuts of MDF. They are then liquid nailed, nailed and completely sealed. We then wrap them with high quality carpet that matches most vehicle interiors. All Boxes feature high grade spring loaded terminal cup(s) for the absolute best connection possible. All the custom series enclosures are made to fit precisely into your vehicle to the get the max performance from every extra inch of wasted space. We guarantee you will not only see a difference in the quality of the boxes we build, but you will hear the difference and that is what is it is truly all about. Adding to bass to a regular cab truck can be a real headache! Luckily we have the perfect solution for this problem. This dual 12" enclosure will fit into any regular cab truck and is designed to fit directly behind the seat. This is a sealed enclosure designed for sound clarity and the box has enough mounting depth for entry and flat-piston style subwoofer(s). We do recommend purchasing subwoofer grille(s) for this model enclosure to protect your sub(s) from rubbing?á into the seat. Our boxes are made from precision cuts of MDF. They are then liquid nailed, nailed and completely sealed. We then wrap them with high quality carpet that matches most vehicle interiors. All Boxes feature high grade spring loaded terminal cup(s) for the absolute best connection possible. All the custom series enclosures are made to fit precisely into your vehicle to the get the max performance from every extra inch of wasted space. We guarantee you will not only see a difference in the quality of the boxes we build, but you will hear the difference and that is what is it is truly all about. 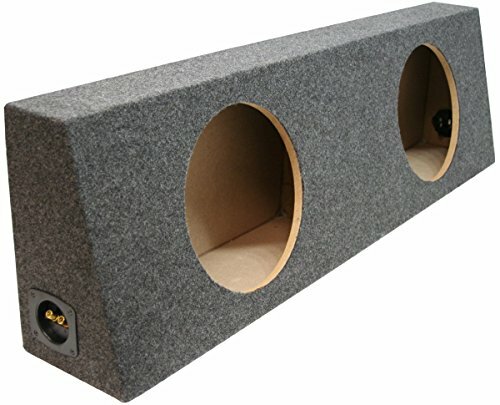 Compare prices on Regular Cab Truck Subwoofer Box at Shopsimal.com – use promo codes and coupons for best offers and deals. We work hard to get you amazing deals and collect all avail hot offers online and represent it in one place for the customers. Now our visitors can leverage benefits of big brands and heavy discounts available for that day and for famous brands.